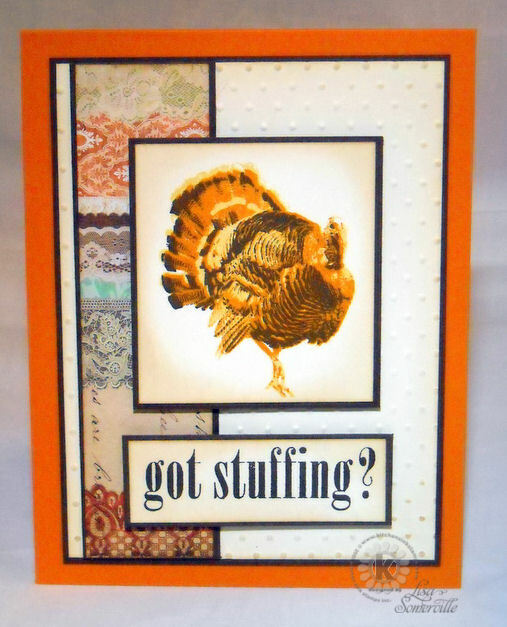 Designs by Lisa Somerville: Got Stuffing? Happy Kitchen Sink Stamps Monday, thanks for stopping by, I hope you had a great weekend! I can't believe that next week is already Thanksgiving, time for me to ink up the Kitchen Sink Stamps 3 Step Turkey Trot before it's too late! Inspired by this weeks Unscripted Sketch, I added a few elements and incorporated some Basic Grey paper to represent the square panels in the sketch. The larger Vanilla panel is embossed with the Cuttlebug Swiss Dots folder, then lightly sponged with Ranger Gathered Twigs Distress Ink. The Turkey and sentiment are both from the 3 Step Turkey Trot set, stamped on Vanilla card stock, layered on a Chocolate panel, then adhered to the base card with dimensionals. lol, I came over to see what you'd been sewing, forgetting about thanksgiving turkeys!!! Ol' Tommy never looked better, dressed out in his finest! Beautiful, fun card. Love this fabulous Thanksgiving design with your bright turkey and beautiful papers!! Sensational card, Lisa! Love that, "Got Stuffing." The turkey is pretty awesome also! Beautiful colors and papers, so perfectly combined! That big bird makes my mouth water! Beautifully done! Great card love the turkey and the sentiment. LOL Thanks for playing along with us at Unscripted Sketches. Hope to see ya next week. Lisa, another wonderful card using the Kitchen Sink stamps! LOVE the card and love your use of the Unscripted sketch. Perfect Thanksgiving card, Lisa! Great way to use the designer paper! Thanks for playing the Dress Down Rebel Challenge on RRD! Great looking turkey, Lisa. I really liked the layout on the card. The squares with the Basic Grey paper look really great next to the Swiss Dots embossed on the other paper. Don't you love the Seasonal Distress Inks! Love em! Too fun, Lisa! Your turkey is just perfect, and you roked this sketch! Love it! The sentiment is always a hoot with that fantastic turkey! Lovely coordinating paper! Great card, that image is such fun! Thanks for joining us Sentimental Sundays & Good Luck! What a perfect combination of color, patterned paper, texture and an awesome looking turkey! Thanks for sharing your creation at Unscripted Sketches! Perfect card for the season - love the colors! Thanks for playing at Unscripted Sketches! Great card and fantastic take on the sketch too!! !